In 2003, we decided to investigate the dynamics behind editing in Wikipedia. History flow is the method we invented to make sense of the data we collected. Studying Cooperation and Conflict between Authors with history flow Visualizations Fernanda B. Viégas, Martin Wattenberg, and Kushal Dave. 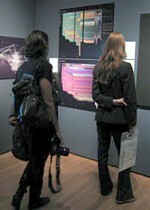 CHI 2004. Fernanda B. Viégas, Martin Wattenberg, Jesse Kriss, Frank van Ham. HICSS-40, 2007. The first image below is the diagram for the article on abortion. The black gashes show points where the article has been deleted and replaced with offensive comments. This type of vandalism turns out to be common on controversial articles. Even articles that are not controversial are sometimes targets for malicious users. The image below shows the history of the article on "history". The rightmost black slice shows when a user replaced the entire article with the simple word "ha." If vandalism is so common, why do you see it so seldom when you look up an article on Wikipedia? We performed a statistical analysis in 2003 to answer this question, and discovered that the median lifetime of certain types of vandalism is measured in minutes. This result has been replicated more recently, both by our lab and researchers at PARC. History flow diagrams helped us understand Wikipedia in 2003 when it was very young. (Our 2004 CHI paper was the first computer science publication analyzing the online encyclopedia.) Since then, the site has grown enormously and the dynamics have become even more complex.